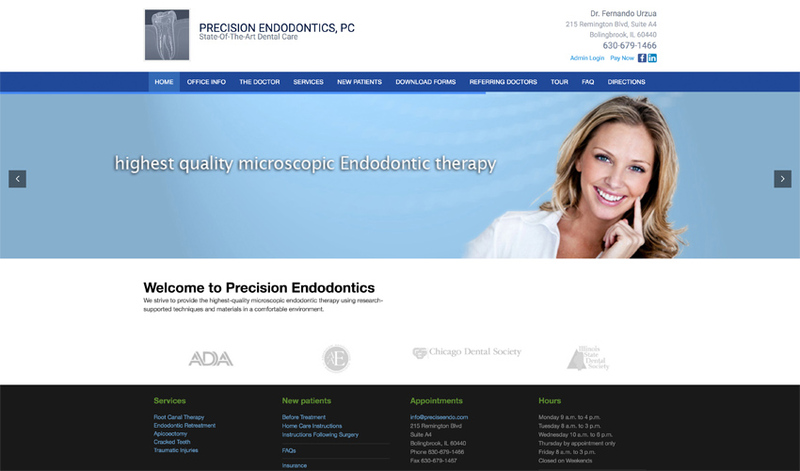 Precise Endodontics (PreciseEndo.com) does advanced endodontic dentistry in the Chicago area. Other dentists refer patients to them. PreciseEndo.com had worked previously with jSinger Marketing to do minor updates to its ColdFusion website. ColdFusion is a very dated web technology, and the Precise staff couldn’t update it without technical knowledge of HTML coding and FTP’ing of files. jSinger recommended a move to WordPress, the most widely-used software today. This makes it easy for Precise to do changes in house. Precise wanted to save money, too, so they decided to keep their old visual design instead of re-branding. This also was the ideal time for other valuable changes such as making the site responsive for mobile visitors. The site is now mobile-friendly, satisfying about 50% of visitors who look at the website on phones. The Precise staff can now make their own real-time website updates. Patients can pay their bills online.